There are many things I love about President’s Day. First of all, it is perhaps arguably the only Federal holiday free of convention. It arrives without any tradition attached to it: no fireworks, no barbecue, no parade, no turkey. There’s no pressure whatsoever to spend the day in a certain predetermined or, worst, prepackaged fashion. Some may argue that this is the reason why it’s confusing: no ritual to follow, no fun. Are you kidding me? Seriously, are you freaking kidding me? You got 24 hours of free time that you can devote to yourself, and instead you’re rumbling in discontent about it? Let me tell some of the things you can do with your free time. First off, you can revise some facts about American history. It’s President day after all so let’s put it to good use. There are many fun anecdotes about Pres. Washington or Lincoln never mentioned during your high school history class but worth knowing. You can also workout. Always a wise thing to do. Finally, you can cook something healthy and delicious. As for myself I did all of these three things. I studied, trained and cooked. The most relevant activity was the latter. I baked my first ever paleo pizza. Now, that was quite something. I wasn’t sure at all at the beginning but I have to admit that what came out of the oven was a straight passport to pizza-heaven. So surprisingly good. The crust is made of cauliflower, mozzarella cheese, egg and seasoning. It holds together really well and you can easily eat the pizza with your hands. 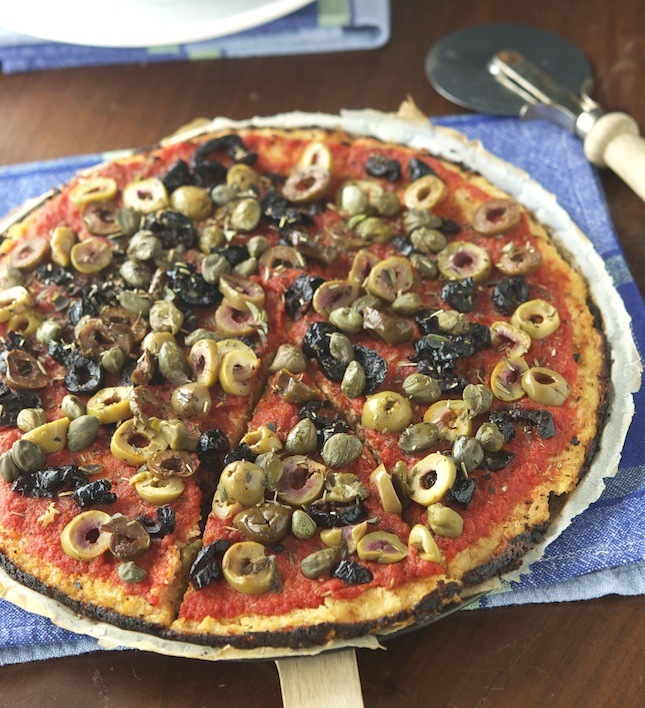 For the topping I skipped the cheese (as there’s already some in the crust) and just focused on tomato sauce, olives, capers and anchovies. According to my friend Freddy (aka the pizza expert) pizza sans cheese is called Pizza Marinara. So there you have it: a paleo pizza marinara. Grain-free, gluten-free, low carb, low calories, good and healthy. Honestly worth a shot. Paleo Pizza Marinara Print this recipe! The whole pizza pie yields 490 calories, 25 grams of fat, 38 grams of fat and 40 grams of protein. I wonder whether this pizza lasted long enough for you to find out how long it will keep in the fridge? Or possibly whether it freezes well? 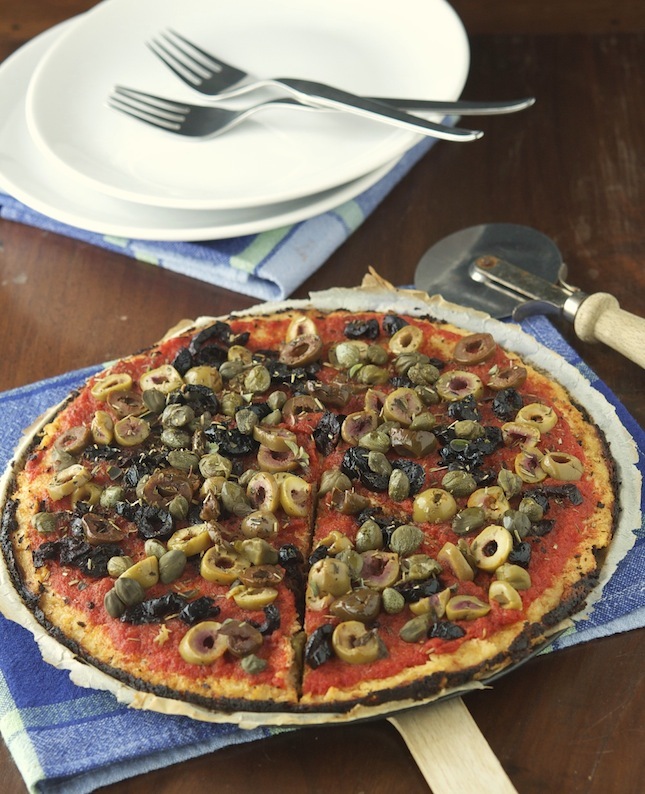 This would make a good lunch for work if you could make one pizza at the start of the week! Honestly, the pizza didn't make to the fridge (it was too good). However, I think it should refrigerate quite well. After all, it's just cooked cauliflower with egg and cheese. But you know what? I'm gonna bake another one this week and do the "fridge test" and "the "freezer test". I'll let you know the outcomes! I've never heard of a dough made from straight veggies...cool idea! This pizza sounds great. this wouldn't actually be considered paleo would it? because of the inclusion of the mozzarella in the crust? There is a stricter interpretation and looser one. After careful review of the literature it seems that the latter is prevailing. Provided that, if you decide to consume dairy on a paleo diet you should pick real dairy, no low-fat garbage. In this respect, mozzarella cheese (real mozzarella cheese not the plastic processed stuff) is made with full fat milk hence admissible. I've never actually a cauliflower crust yet, but I've heard such good things. i can't wait to try this! made this tonight w/just sauce and caramelized onions, delish! i want to make this but dont havea microwave? other options? You can steam (or boil) the cauliflower for a couple of minutes. What really matters is that you squeeze out all the moisture from it afterwards. The cauliflower rice should be as dry as possible, that's the important bit! Yammi Yammi ... this pizza is looks very testy !! I will try to eat this one. Do you have to cook the cauliflower in the microwave? It seems it would have a lot less moisture if it wasn't cooked until it is in the oven. I made this today and it was delicious, but it was a lot of working squeezing out the water. If you don't cook it in the microwave and squeeze out the moisture beforehand it will release all the water in the oven and it's going to be a mess. I've tried it before, and trust me it's not something to look forward to. The extra work does pay off. Hi MIke... I tried your pizza today and I can't figure out what went wrong. It stucked on the parchment paper even after I greased it. Also, it didn't really form a dough in the oven, it was breaking a lot. I tried to squeeze as much water as possible, so I dont't know if maybe that was not enough. Maybe I made it too thin? Any thoughts? Oh gosh Marina I'm really sorry that the pizza didn't worked out as planned. 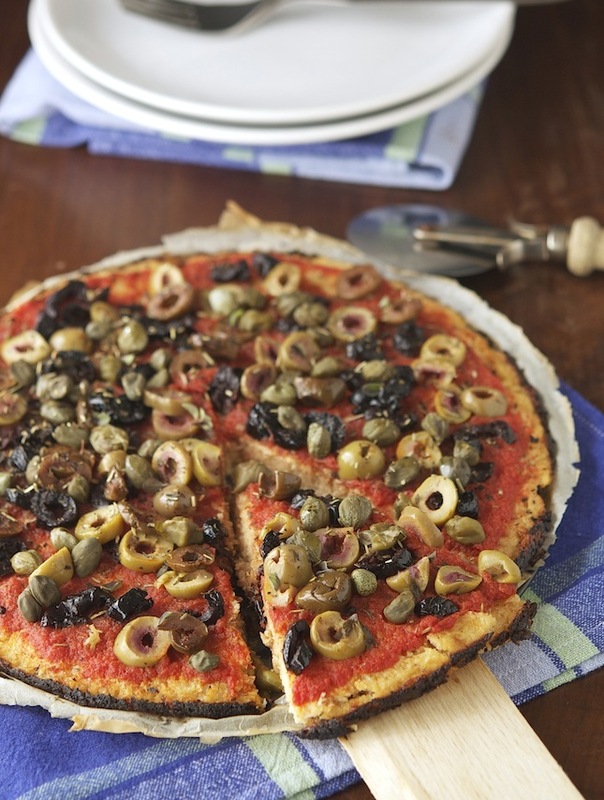 I had the same problem (i.e., the dough not really forming and sticking to the parchment paper) one of the first times I ventured with cauliflower crust. I figured it all had to do with the water in the cauliflower (I didn't squeezed it enough). So do look out for those two key factors. I hope it'll turn out as it should next time! What type of mozzarella are you using for this? Is it the fresh (somewhat wet) kind or is it the more dense low-moisture mozzarella? Also, the ingredients listed say "light mozzarella" as opposed to full fat, which I think may be more suitable for paleo. Think I could use that without an issue? Hope to make this very soon, it looks fantastic! Just throwing it out there: there is no scientific proof that microwave has any worse effect on nutrients in food than other kinds of heat processing. The recipe looks like the fulfillment of my dreams. I am trying to do LCHF, after five days I still identify complications, but am happy and up for the journey. Food like this makes me grateful for the shift: so far I believed any pizza is toxic and bad for me, now I can make it and enjoy it knowing that it will benefit me. What a life-changer. Thank you so much for this gorgeous, love-inducing recipe ;). What kind of tomato marinara did you use? Would subbing the sauce for sliced up tomatoes make this even healthier? Hi! I just pour boiling water over the cauliflower rice and let it stand for 10 minutes. Then I squeeze out the water, etcetera. I love your recipe! I made it twice without failing. What dairy free substitute would you recommend instead of mozzarella?